Passengers who fly into Orange County John Wayne Airport can get assistance with getting around the airport and the places they need to be in especially if it is your first time at SNA airport. Named after the iconic actor, John Wayne Airport is located in the heart of Orange County and just a couple miles east of Newport Beach. Perfect for decadent family vacations as well as opportune business trips, the area is brimming with tasty restaurants, interesting shops, and friendly faces. Luckily, John Wayne Airport is no different. With plenty of places to leave your vehicle, whether it’s for a prolonged period of time or for a quick moment, John Wayne Airport’s parking layout is more than easy to understand. For quick access to Terminals C, utilize Parking Lot C. For easy access to Terminal B, park across the street in Parking Lot B2, located across the street from Thomas F. Riley Terminal beside the airport’s Ground Transportation Center. 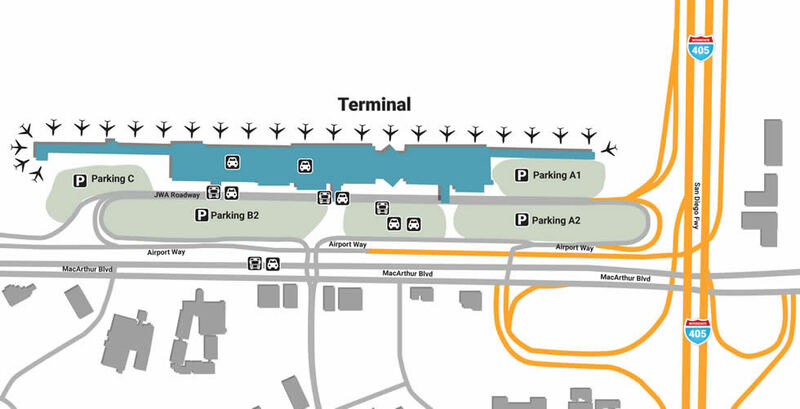 There are two available lots for Terminal A, one being Parking Lot A1 to the right of the terminal, and the second being Parking Lot A2, located south of the terminal. For long-term parking, check out the Main Street Lot, located off-airport, but typically holding the most open spaces. Besides the mundane tasks provided by security and public safety, John Wayne Airport’s services go far beyond the necessary. The Bob Hope USO, located near Terminal B, Baggage Carousel 4, makes coming home to your family even sweeter with exclusive amenities like free Wi-Fi as well as stocked canteens, movies, and video games. New mothers in need of a room to nurse in should head to the special mother’s lounge in Terminal B between Gates 11 and 12. There are several pet relief areas, one outside Terminal A’s parking garage and another beside Terminal C’s Gate 12. Many think that being stuck at an airport is the same as being in prison, but you’ll find that you’ve got all the choices in the world at Bob Hope. If you need to get a few knots out of your tense back before heading to an important meeting, unwind at XpresSpa, located at Gate 10, Terminal B. For those interested in picking up something to keep the sun back, stop by Sunglass Hut (Gate 8, Terminal A) for a fresh pair of shades. For last-minute products and souvenirs, head to the Orange County Market, a kiosk located in Terminal A, between Gates 7 and 8. One of the best parts of being stressed is that you can easily eat it away. Do so while you wait for your flight, eating fresh mediterranean at La Tapenade (Terminal B, Pre-Security), or enjoy a nice cup of coffee and egg McMuffin at McDonald’s (Gate 5, Terminal A). Because you’re in California, you’re bound to freshness, which makes the Farmer’s Market (Terminals A and B, Gate 8) the perfect stop to refuel and start focusing on what’s ahead. Another unique fixture is Vino Volo, a wine lounge located right outside Terminal B’s Gate 9.